Logic and adventure fun for all ages - for puzzlers and fans of logic and mystery. A high degree of replayability thanks to different puzzles. The Quick-Logic-Adventure game principle, which has already been successful with iLogic Crimes (#1 iPad game in several countries), is brought into the middle ages with knights, princesses, clever and funny animals, mysterious landscapes, dragons and magic aplenty! Learn and perfect your logical powers of deduction, memory and capacity for thought. Use your sharpest tool... your BRAIN to solve this tricky logic adventure and be the hero who saves the princess! Thanks to the various levels of difficulty it's suitable for EVERY age: 7 to 107! The princess is missing - only you can save her! You - a young, shy knight - set off on the search for her, luckily you have a special power... you can talk to animals! Cooperate with the animals, collect clues and use your powers of deduction! This is the only way you can find the princess. Experience thousands of different combinations of clues as well as 6 different stories regarding where the princess is hiding and what has happened to her. Speak to the animals in the forest, look for clues, discover wonderful landscapes, explore caves and castles and meet dragons and magicians. Be the hero and save the princess! Piece the clues together with the instincts of a detective and establish a pattern from the characteristics, locations or groups of the animals using the information gained. Using clever reasoning and by drawing logical conclusions you can find the princess quickly. BUT BEWARE - only the best earn achievements. Unnecessarily talking to animals, asking unnecessary questions and suspecting the wrong animal will cost you valuable points and achievements! Can you find the princess in time? TRAIN YOUR BRAIN in this enjoyable princess, hero and animal adventure! 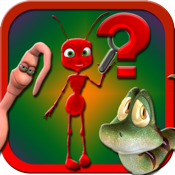 In this Quick-Logic-Adventure (QLA) you obtain the most important facts quickly and concisely and solve the exercises through analysis and clever logical reasoning. The puzzles are different every time and therefore always create new challenges and encourage you to play again. Compare your achievements and points against your friends. Get your brain's activity up to speed and experience mental exercise like never before. Also try the exciting detective logic game iLogic Crimes!